Jaipur, April 10: Having continued their superb form at home, Chennai Super Kings will now head to the Sawai Mansingh Stadium in Jaipur to take on Rajasthan Royals in their Indian Premier League encounter on Thursday. On paper, CSK are favourites as they sit atop the points table, but then, this game is not played on paper. 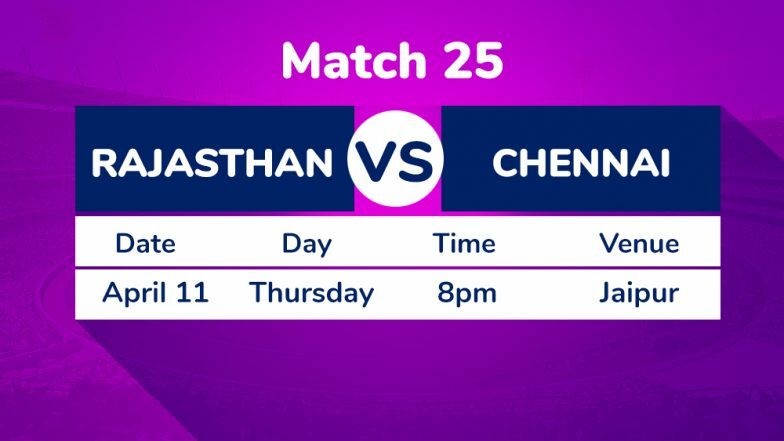 Having lost their previous game at home against Kolkata Knight Riders, the Royals led by Ajinkya Rahane will look to come back strongly in this encounter against M.S. Dhoni and boys. But firstly, they need to get a hang of the wicket. Having dished out a slow one in the game against KKR, they found themselves in deep trouble and considering CSK's love for slow turners, another slow wicket will play into the visitors' hands. In the batting department as well, too much dependence on Jos Buttler and Rahane at the top needs to go. Even though Steve Smith played a quality knock in the KKR game, his innings was pretty slow and didn't help the team. Similarly, someone like Ben Stokes needs to be used much higher in the batting order. Considering his destructive nature, he needs to be given enough balls to face. Rajasthan Royals vs Chennai Super Kings Live Cricket Score 25th T20 Match.